Throughout my vast nail polish collection there's always a shade I go back to: Nails Inc Baker Street. It's no surprise why this shade is such a cult classic, it's one that suits every skin tone and someone is bound to comment on it everytime I wear it. Here's why you should pick it up. 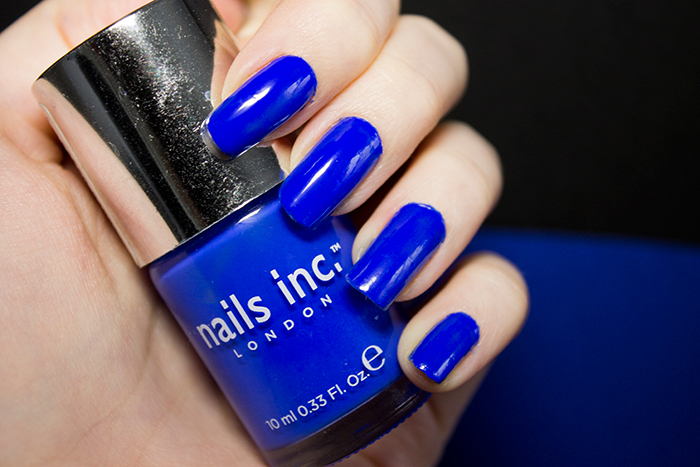 Baker Street is a cobalt blue shade with a glossy finish. It's known as one of Nails Inc's hero shades and even has a gel finish version should you need to up the glossy factor. I once had a colour consultation to see what colours suit me and this was right at the top of the list. As with all Nails Inc shades, this one applies beautifully with very minimal effort. I do find you need two coats but once they're on, the formula quickly sets so you can get on with things. As for longevity, I found I got around 5 days wear before any sign of chipping occurred which is pretty impressive to me. Though if you wanted a little bit longer wear, the gel finish version is probably your best option. It's a shade that suits everyone and whether you're buying it for a loved one or treating yourself, everyone will be sure to love it.